Manhattan is always changing, and it seems like a new development pops up every day. We’ve compiled a list for you of some of the most breathtaking new developments that you’ll be seeing around the area. From renovations on elegant pre-war buildings to glass-enclosed high-rise condos, these buildings are gorgeous and stunning, and pricey. This beautiful industrial-style building is a fully renovated chocolate factory (aptly named after the Catalan word for “chocolate”) with tons of cool and interesting touches. The building features vertical gardens as well as a cast aluminum facade giving the building a unique rugged industrial exterior to contrast the luxury condos it houses inside. There are nine floors in the building that will house 20 units. The hanging gardens and organic shapes constructing the facade of the building make it completely unique from a majority of its upscale counterparts. The apartments’ designs are definitely as funky as its exterior. There are little quirks in each residence, and the shapes formed by the walls, ceilings and built-in appliances have an interesting organic feel to them. One of Tribeca’s new developments is at 30 Park Place, and will be home to both a hotel and luxury condominium, in its lower and upper levels respectively. The building is 82 stories tall and features incredible views in each direction. The penthouses available give their residents breathtaking views of the surrounding city, complete with spacious terraces. Most of the available apartments in the building are currently in contract. This new beautiful glassy building is being built this year, and features an interesting cantilevered layout. There are floor-to-ceiling windows in all of its 38 residences among twelve stories. There is also a shared roof deck and garden lounge. The apartments are all elegant and offer you ideal city exposure both through their views and its prime placement in the coveted Lower East Side. It may not be tall, but the building absolutely stands out in its own way. It is expected to be completed later this year. Modest but luxurious, this new gorgeous 18-story building on the Upper West Side has a uniquely rustic feel. A special characteristic of the building is its glass doors lined in mahogany that outline each residence, and they look even better from the inside than they do from the outside. Many of its residences are currently in contract, and many are lucky to be able to call these beautiful spots their homes. The building is nestled in a quieter section of West 77th Street. A number of the apartments get their own terraces as well. Have you seen a towering masterpiece that looks somewhat like an enormous game of Jenga in Tribeca lately? If so, it was definitely the new condos at 56 Leonard Street soaring above the neighborhood at 60 stories high. Each of the building’s 145 condos has its own outdoor space, and each residence is unique. The views are breathtaking from every side of the building, and it stands taller than most buildings in the city itself. Designed by renowned architects Herzog and de Meuron, this is one of the most intriguing new members of New York’s skyline. Most of the residences are already in contract if not sold already, but PH58 is still available for a mere $34.5M. Illustration from the building’s website. The new building is a quaint yet luxurious condominium with a classic Indiana limestone facade giving it an elegant 19th century appeal. Each apartment offers a Juliet balcony, as can be seen in the above photo. Additionally, the elevators directly service each of the residences. The building’s 5-bed and 5-bath penthouse gives exclusive access to the expansive rooftop. There are only nine of these pristine residences in the building. If you take a look at their website, you will find extensive information and descriptions of the property. You’ll soon find this building in West Chelsea on West 24th Street between 10th and 11th Avenues, and will stand out among its neighbors with its interesting colors and materials. The building has its own wine cellar. The design team Roman and Williams teamed up with JDS Development Group to create this one-of-a-kind residence. The green terra cotta and copper facade are breathtaking enough themselves. Each residence has 11-foot high ceilings, which one of the developers noted as a factor that is becoming increasingly desired by apartment seekers. 53W53 is giving One 57 some company among soaring condos at the foot of Central Park. This building’s interesting exterior design gives each residence its own unique view through its framed windows. And in addition to the luxury amenities provided (pool, fitness center, wine vault), the base of the building will house a section of the Museum of Modern Art. This boutique downtown condominium will be converted from what was previously a Synagogue. There are only a few units in total, but the apartments are expected to be gorgeous. The building was built in 1910, and will retain its limestone exterior and original stained glass windows. This is part of a newly common trend for synagogues to allow developers to build condominiums in and above them. These redevelopments help both the synagogues and developers, helping the religious institutions more easily fund themselves while hosting new and interesting apartments often with unique decorative features. You may not know, but there are a few seemingly minor details that may keep your apartment from selling at the price it can and should be sold for. When putting your apartment on the market, it is important to keep in mind this list of factors that you may consider nit-picky, however are crucial to getting the most money out of your sale. Good brokers will be sure to tip you off to these, since they are so in tune with the market. However, you might want to check out this list before you consider making any further moves towards marketing and selling your home. People feel differently every day of the week, and it’s important to pay close attention to which days may be the most successful for a sale for you. It’s been noted that the best day to list an apartment is Thursday. This makes the apartment fresh for its upcoming weekend open houses, and is also best for hosting open houses two weekends in a row, because it doesn’t seem as if it’s been on the market for too long. If you list on Monday, for example, a weekend open house may feel like a lifetime away, and it can be forgotten about and pushed into the background of apartments listed just days afterward. Few sellers tend to at first steer away from having their apartment represented by a broker. However, for those that do – the lack of a broker might be a detriment to your success and could potentially cost you more money, time, and energy in the process. Brokers that help you sell often remain predominantly in contact with buyers’ brokers. With 90% of buyers in Manhattan being represented by a broker you could be cutting out the largest segment buyers by listing on your own and not soliciting brokers. It is easy to get pushed under the radar as an independent seller, and you might be missing out on a lot of expert tips that you might not even consider. Additionally, many buyers expect to a deal to be cut because of the lack of brokers involved, and so you may end up getting your apartment for slightly less than you expected. And the legal work involved with selling an apartment in New York City causes enough stress on its own and may slow down your process. Pricing your apartment can be tricky, with a lot of factors to consider. Once you have a general idea of your apartment’s market value, it can be beneficial to make sure that your price can fit within a couple of different ranges. For example, price searches StreetEasy round to the nearest thousand, so pricing your apartment at an exact thousand can put it in at least a few different price range searches. More specifically, if your home is worth $1,000,000 it would be prudent to price it at $1,000,000 instead of $999,999. This way you’ll show up in searches for people who search for $900K – $1M and $1-$2M. It’s important to not put yourself in a smaller box when pricing, and making sure that your price number is accessible in online searches. This really can give your apartment a lot of visibility. It’s been suggested by HGTV to declutter your closets before showing your apartment. They even recommend that you take out half of the items in your closets so as to give the idea that your closet is more spacious. Across the board, it is important to buyers that they have ample space, especially in closets where a lot of “stuff” tends to accumulate. Additionally, it has been noted that expensive items in your closet may even increase the offer on your place. These will cause those looking inside to develop a longing to be “in your shoes,” and thus in your apartment. Depending on which neighborhood you’re selling in, you’ll want to tailor the description of your apartment. For each borough in New York, there is a certain set of attributes that buyers typically look for. For example, peaceful neighborhoods and amenities such as renovations rank higher in homes in Manhattan than in Brooklyn, where an “Old-New York” is more often sought after. DNA info had information on these trends and how sensitive buyers could be to certain words and phrases when hunting for the perfect place. Certain attributes that you may highlight or neglect to highlight can keep buyers from ever looking into your apartment as an option. Charging too much for an apartment initially is a big problem that ends up devaluing a lot of sales. It is crucial to have a good idea of how much your apartment is worth before deciding to broadcast your asking price. Many sellers, when heavily attached to their home, list their house above market price because of their experiences in the home, and their sense of pride in having built such a home for themselves. This is known as the IKEA effect, and it usually does not do sellers any favors. The IKEA effect is characterized by those who feel their product is worth more because they “built it themselves,” to some extent. Many people feel that through making their apartment a home for themselves, they deserve more from it. When it comes to pricing, sellers must learn to detach themselves from their homes and realize that buyers aren’t interested in the personal history a seller may have with their apartment. Often times, overpricing results in underselling. When it comes time to put your home on the market, make sure that you pay close attention to how you are selling your home. There are a lot of factors to consider, some more obvious than others. Details really do matter! Having an experienced broker on your side can make this much easier. Currently, our team has seen a lot of interest in renting and buying apartments on the Upper East Side, most specifically a number of apartments we’ve been listing on East 87th Street. We work with buildings in the area, and they are noticing a high demand for their properties as the spring season approaches. It’s no surprise, seeing as the street itself is a picturesque characterization of one of the most esteemed neighborhoods in New York City. For those owning property in the area considering listing, it would be a smart move to do it now, or at least soon. From a financial perspective, spring is an ideal time to start marketing your apartment in New York. The season sees an influx of incoming renters and buyers coming in from all directions. Recent graduates start to move to the area as they are receiving job offers, thus increasing the uptick in renters. The weather change generally gives potential buyers more energy and optimism. This comes through in the numbers: May is statistically the most successful month to put your apartment on the market in Manhattan, as noted by Urban Digs. During this month, over 5,500 written contracts have been made over the past five years, followed closely by those written in April, its immediate runner-up. Putting your home up now could turn out a fair amount of profit for you. Apartments on the Upper East Side can fulfill both the needs for a quiet neighborhood as well as an urban setting, characteristics ideal for many buyers looking into Manhattan’s housing market. With so much interest during this high-traffic season, it is unlikely that you will have to lower your asking price to accommodate the market. Feel free to reach out for a no obligation market analysis or click here. The Upper East Side saw a major sale this past week closed at $31 million with an enormous penthouse on 33 East 74th Street, which rests on top of a newly repurposed condominium building on the corner of East 74th and Madison Ave. The façade of the building remains as it were when first constructed, however the interior of the building has been completely revamped to accommodate modern living. The building was a result of a collaboration between two critically-acclaimed forces: Interior designer Alexandra Champalimaud and Architectural firm Beyer Blinder Belle. The brownstones making up this property were built in 1876, and were repurposed as 10 custom designed high-end condominiums. There are still a few condos available on the property for those willing and able to experience such luxury. The building’s site, 33east74.com, contains all of the property’s information, noting the building’s history and what it offers to its residents and the surrounding community. 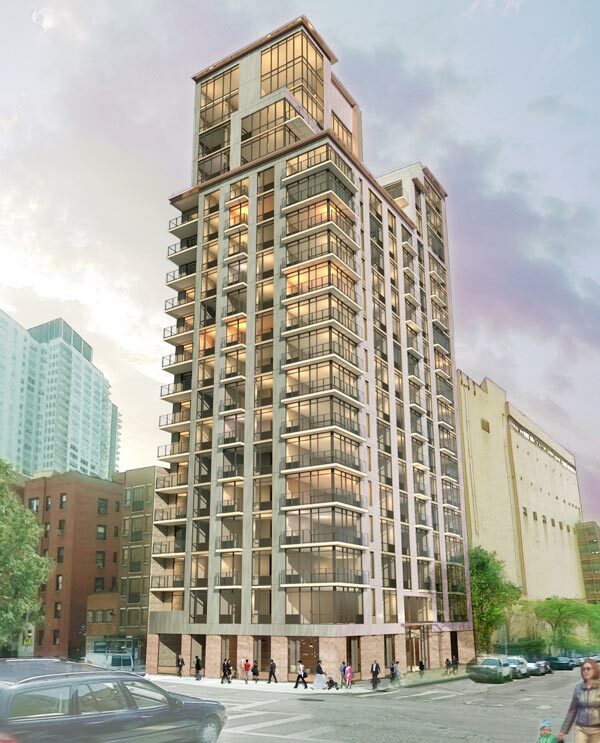 Having already placed the construction fences on the site, the new residential tower at 501 East 74th Street is on the corner of York Avenue and 74th Street and is sponsored by Sky Management, which is represented by Benjamin Ohebshalom. Slated to sit at 71,703 square feet, this building will stand 205 feet tall, with 20 stories and 80 residences. The architect on this project is the Stephen B. Jacobs Group. Currently it is undisclosed whether this tower will be for condos or rental units, but the average unit size is expected to be around 860 square feet. From the rendering, the top of the building looks as if it will house an expansive multi-story penthouse. The building’s renderings show a fairly upscale-looking beige stone structure mixed with large glass windows, and balconies on at least two sides–some seeming to be full balconies and others Juliette. From a transportation standpoint, the location is somewhat remote, sitting several blocks from a subway station, although after the Second Avenue subway opens that will change. This week’s list of most and least expensive properties on the Upper East Side comes from information obtained through StreetEasy. Perched atop the landmark Mahattan House at 200 East 66th Street, Penthouse E21-01 is a Lenox Hill condo with over 4,000 square feet of living space. Including four bedrooms, five baths, staff room, grand living/dining room, two fireplaces, and windowed kitchen, this exquisite home exudes luxury. The wraparound terrace offers over 2,100 square feet of outdoor space, accessible from the living room/dining room, kitchen, and three separate bedrooms. The kitchen offers stained oak with stainless steel cabinets, stone counters, and a mahogany island. The master bedroom offers waterworks, a freestanding bath as well as a glass-encased shower and custom dimensional stainless steel surround fireplace. Building offers a concierge/doorman, cold storage, bike room, playroom, elevator, garage, gym, laundry, live-in management, and recreation facilities such as a yoga room. Expected occupancy is Spring of 2015. Listing is provided by Sunshine Marketing Group at Corcoran for the asking price of $12,500,000. In the same Manhattan House building, Penthouse C21-01 is available at 200 East 66th Street, offering four bedrooms, four baths, one half bath, and a 627 square foot terrace wrapping around the living room. With wood-burning fireplaces, large windows, stainless steel with wood kitchen, white oak floors with gray stain, and extreme elegance, this Lenox Hill home offers over 3,70 square feet of indoor living space. The master bath includes a hand-chiseled bleached oak vanity with white counter tops and under mount sinks. The building provides a gym, playroom, bike room, doorman/concierge, elevator, garage, and more. Part of The Penthouse College offered by Sunshine Marketing Group at Corcoran for the asking price of $11,300,000. Just down the street is Chez 66, located at 21 East 66th Street #11, at the very top of the building. This Upper East Side prewar condo building was built in 1921, and converted in 1989. Kitchen and breakfast room are newly renovated with marble countertops and incredible natural light from huge windows. The breakfast room leads to the formal dining room, to the large corner living room, and then to the library. The master bedroom plus two other bedrooms and staff room are located on the opposite end in a private wing of this full floor condo. Includes 3,668 square feet of living space with four full baths, one half bath, laundry room, private elevator vestibule, separate service elevator, and two fireplaces. Building offers doorman and pets are allowed in this 11 story, 19 unit building. Listing provided by Reba Miller at RPMiller Realty for the asking price of $10,500,000. This week’s least expensive listing gives charm and functionality in this starter studio located at 337 East 85th Street #4A in Yorkville. Hardwood floors, decorative painted brick fireplace, separate windowed kitchen area, and tiled bathroom. Building has live in management and low maintenance fees. Property listed by John Cronin at Douglas Elliman for $239,000 asking price. This 500 square foot one bedroom co-op sits at 521 East 88th Street #5D on the top of this five floor, prewar walkup in Yorkville. Solid wood flooring, high ceilings, Italian desinger ceiling light fixtures, built-in bookshelves, and renovated kitchen with stainless steel appliances. Well-managed building with 24 hour on call super as well as a new roof, and newly painted hallways and stairwells. North and south exposures. Listing provided by owner, asking $327,000. A one-bedroom junior in Yorkville sits at 212 East 88th Street #2A. This co-op offers a living room with two windows, dining area with Murphy bed, closet, and built-in storage. Separate kitchen with pantry, washer and dryer in the unit, and large windowed bath. Listed at Citi Habitats by Donna Bradbury for the asking price of $345,000.